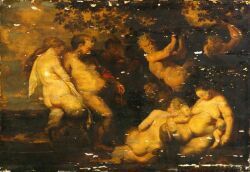 Bacchanalia. Unsigned. Oil on panel, 28 1/4 x 41 in., unframed. Condition: Cradle to panel, retouched, flaking, losses, surface grime, craquelure. N.B. The original composition is in the collection of the Pushkin Museum, Moscow.